Just a couple of weeks after reports that London's house prices had risen 16.3% since last year, one of Britain's leading mortgage lenders, Nationwide, has warned of a 'natural correction' in the housing market. 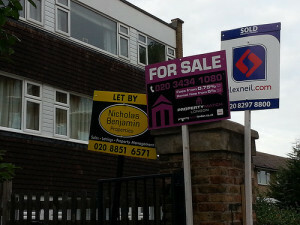 "There are signs that the London market is topping out," he added. "By which I mean that the rate of increase in house prices is likely to slow down. What we will see over the next year is the big difference in house prices in London and elsewhere will narrow considerably as prices elsewhere begin to pick up." What could be the driver behind a potential slowdown? Despite the frequency with which we use the word 'unsustainable' to describe the housing market, the meteoric rises over the past couple of years really are unsustainable. Recent changes to mortgage lending criteria mean that borrowers' ability to pay is being more closely scrutinised and amounts lent reduced. It's probably a bit too soon to know if the lending changes are directly affecting asking prices but we wouldn't be too surprised if they do eventually. London property ownership is still a safe haven though, and likely to remain unaffected by mortgage rule tightening — earlier this year we reported that a massive 61% of new London homes were bought by overseas investors and looked at the reasons why the capital is so attractive. Meanwhile, anecdotal evidence suggests that asking prices are merely a starting point — one Londonist reader told us about a two-bed Zone 2 property marketed at just under £700,000 which sold within two days at more than £750,000. Photo by RachelH_ in the Londonist Flickr pool.